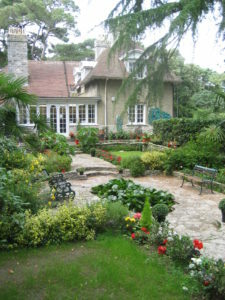 Canford Cliffs Library was one of two Edwardian libraries designed and built in the very early 1900’s. The library has been active for over 60 years since being re-established. The Friends of Canford Cliffs Library was established in 2005. We try to make sure the librarians and Poole library services efforts are able to sustain and develop the library in the local community from funds raised from membership, coffee mornings, lunches, donations and fund raising activities. New Members embers can join at the library. During 2015 the FCCL took major steps to restore the Edwardian garden with its sunken pond to its former glory. 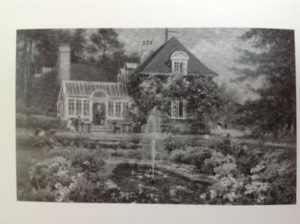 A look at the picture on this page of the library in 1933 contrasted with a current photograph shows the largely unaltered garden and library from the way it is nowadays, only the roof of the conservatory changing. After a major effort for over a year on restoration, several members say it is now better now than at any time they remember. This has proven very successful, and offers a really tranquil and beautiful setting from late Spring to late Autumn for members to use in the daytime. The intention has been to attract more people from the community through the library, becoming both users and supporters. Similarly there are regular weekly Monday morning coffee meeting when a number of members and their guests come either periodically or regularly to meet and chat from around 10:15 – 11:30am. Membership is £4 a year though many also give donations. You can join with one of the librarians. Two lunches a year are held in June and December for members. In January 2016 a well-attended lunch was hosted for the librarians at Parkstone Golf Club, while further guest visitor talks are planned as is a garden party to raise funds to be held during the summer months besides the mid-year luncheon. Still expanding its membership, members and visitors of wide age ranges becoming new members soon make new friends, and enjoy taking out books, dvd’s audio books and much more. We are tremendously fortunate in having a really active community library with enthusiastic library staff, and the FCCL is there to help support their objectives serving the local community.